Is Mediating Prenups a Form of Marital Mediation? I started suggesting to clients, who approached me about prenuptial agreements, to consider formulating them through mediation. It turns out it is a wonderful way to do a prenup. At the end, the parties feel fairly treated, and the resulting prenup is not overreaching or over-restrictive. A prenup is not about distrust, control, or impending doom; it's about planning and protecting finances for both of you. 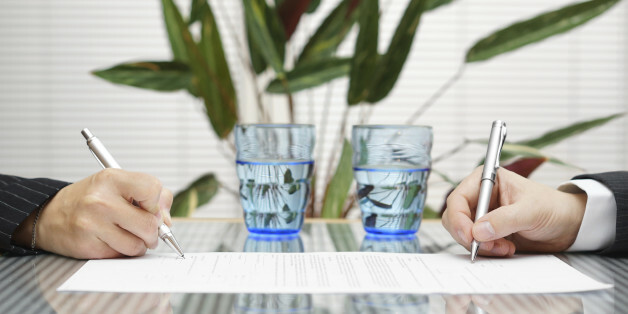 Once the prenup signed, let your lawyers keep the document. Go on your honeymoon, and forget the papers were ever drafted! So you got the tiny blue box tied in white ribbon for Valentine's Day, huh? After you've contacted your insurance agent, there's one more call you need to make -- your family law expert. Yes, it may be unromantic to discuss finances in the event of a divorce, but on the other hand, it is romantic to know that the person you are committing to for the rest of your life is open to discussing any issue, whether it be boring and even emotionally complicated. Most people see love and business like oil and water. But marriage is a legal contract. In fact, marriage is the greatest legal partnership most people will enter into in their lives -- and a family is nothing short of a corporation. A well-drafted prenuptial agreement can prevent future heartache in the event of a divorce, even if the couple does not have a lot of money. Are prenuptial agreements dead? The answer is no. I once began a talk at a conference by saying that a premarital agreement is the most romantic thing a couple can do together. Prenups can be a daunting process of mutual and self discovery. In the long-run, though, it's better to move into a house with clean closets than one with layers of clutter, mess and chaos behind each closed door.